Was richtig gut ist, hat ein richtig gutes Adjektiv verdient. Aber wie viele wirklich starke Adjektive kennen und benutzen Sie? Wir verraten, welche Begriffe für farbenfrohe Abwechslung im Alltagsenglisch sorgen. Do you remember the song “Everything Is awesome (ifml. )toll, spitzeAwesome!” from the 2014 LEGO Movie? Back then, it seemed as if everything was indeed “awesome”. The informal use of this word had spread from the US across the whole English-speaking world and was being used to describe anything that was in any way positive. Now, four years later, everything is “super good”. We’re all “super excited” and “super happy” when things are “super easy”. Not everyone wants to follow trends, of course. Perhaps you’re one of those people for whom everything is “great” or “fantastic”? However, most of us don’t want to use the same small group of words and phrases all the time. We would like to apply a variety of expressions in different situations. In the February issue of Spotlight, we showed you how to avoid the ten most frequently overused verbs in the English language and gave you practical alternatives. This month, we’re doing the same for adjectives. She gave an impressive performance. I had a very rewarding experience. He couldn’t give a satisfactory answer. I think my comments were fair. I think that’s a reasonable suggestion. Is that an acceptable price? This is cutting-edgetop-aktuell, Spitzen-cutting-edge technology. It’s a traditional design with a contemporary twistDreh; hier: Einschlagtwist. She’s caring for her elderly parents. I’m interested in ancient Greek art. The house was full of antique furniture. A senior clarinettist was leader of the band. Their ideas are so behind the times. You’re using an outdated operating system. The book was a huge success. It’s an immense problem for us. He controls a vastenorm, riesigvast business empire. She lost a sizeablebeträchtlich, erheblichsizeable amount of money. I made a colossal mistake. The baby has such tiny hands. Microscopic traceSpurtraces of drugs were found. They suffered only minor injuries. This is a trivial problem. They live in a picturesquemalerischpicturesque village. We’re really pleased with our new kitchen. We’re delightedhocherfreutdelighted to announce the winner. I’m quite content with my life. He was over the moonüberglücklichover the moon. He’s a leading expert in his field. She plays a key role in the firm. It’s vitalentscheidend, unerlässlichvital that we act quickly. He’s a significant person in the case. It was an unusual event. She’s unlikeanders alsunlike anyone else. He has a very distinctiveunverwechselbar, eigendistinctive style. Players in our team are quite diversevielfältigdiverse. We’re like chalk and cheese (UK)wie Tag und Nachtlike chalk and cheese. 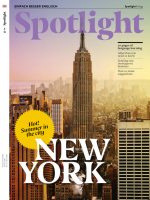 Dieser Beitrag stammt aus dem Spotlight-Magazin 8/2018. Die gesamte Ausgabe können Sie in unserem Shop kaufen. Natürlich gibt es das Magazin auch bequem und günstig im Abo.